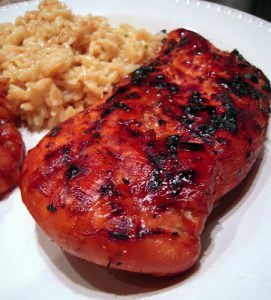 Grilled Coca-Cola Chicken – seriously delicious! Chicken marinated in coca-cola, soy sauce, garlic, brown sugar, balsamic vinegar, and lime juice. 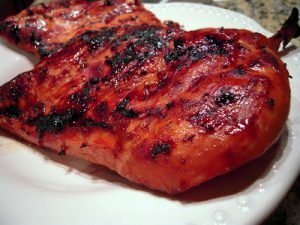 Mix the marinade together and let the chicken marinate overnight in the refrigerator. We make this all the time! It is seriously delicious!!! I got on a 7UP kick earlier this year. I made chicken, biscuits and a pound cake! I didn’t want Coke to feel left out, so I found this recipe for Coca-Cola Chicken over on Jamie Cooks It Up and gave it a try. It was yummy! The marinade was super simple to throw together. I almost always marinate my chicken overnight. I just find it is easier to mix it up and throw it in the fridge before I go to bed so I don’t have to worry about prepping dinner in the morning. I cut the recipe below in half since we were only cooking two chicken breasts. I have plans for a BBQ sauce and cake with Coke in the future.